This quiz in particular amused me a lot, because some of the answers are about scientific publishing and the competitive culture of academic research. When the quiz asks you to complete the sentence “Your BFF spends the average Friday night..” one of the possible answers is “Asking you to collaborate on a scientific research paper and then “forgetting” to put your name on it”. In the next question, you can give “Why you saw only her name printed as a finalist for the Louisa Gross Horwitz Prize in biochemistry for a paper you wrote together” as a common cause for an argument with your best friend. Like most things produced by the fine people at The Onion, it’s painfully close to reality. The “publish or perish” culture in science is such that people scramble to make sure they get their work recognized, and the sort of scenario painted in this quiz is not far from reality. Authorship can determine entire careers, and people do get snubbed once in a while. 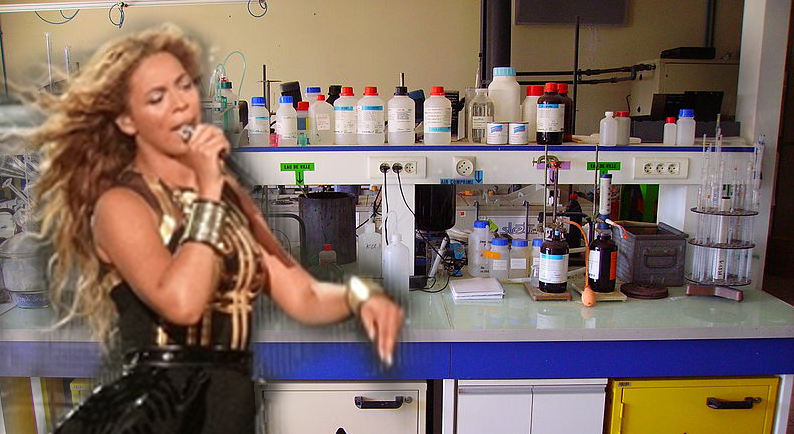 Of course, here the situation is made funny because your supposed collaborator and best friend is world famous singer Beyonce, and Beyonce is not a biochemist. 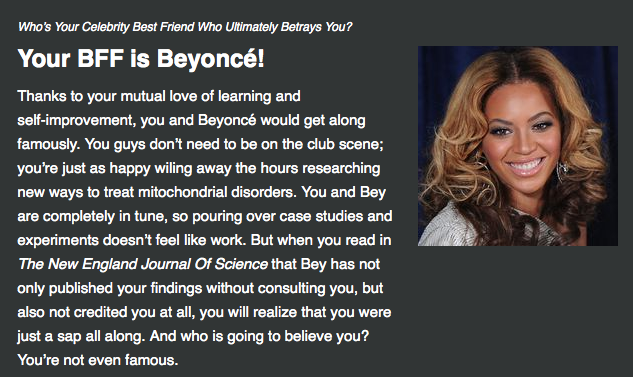 Although researchers named a fly after her, Beyonce herself has never had a career outside of music, and doesn’t have any scientific publications – but some celebrities do! Natalie Portman is a co-author on a neuroscience paper [pdf] from a group she worked with as an undergraduate student. The Offspring’s Dexter Holland is first author on an article about miRNAs that target HIV (his PhD research). Even Colin Firth has a co-authorship in Current Biology, after coming up with the idea to scan the brains of people with different political views, to see if there’s a difference. I also searched for peer-reviewed scientific publications by actress Mayam Bialik, who famously holds a PhD, but there don’t seem to be any. Her thesis is in WorldCat, but she hasn’t published any articles on the topic. Maybe Beyonce left her off the author list. Typical. Image credits: Lab in top image by jean-Pierre on Flickr. Beyonce in top image by Nat Ch Villa on Flickr. Clickhole quiz result from Clickhole quiz.